Lightweight Swivel wire hook, plastic adult top hanger with rail. 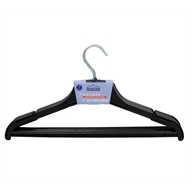 380mm wide hanger, ideal for shirts, t-shirts, blouses and pants. Manufactured from rigid polystyrene resin for longer life.